When the hubster and I just started dating, we use to frequent Carolina’s Italian Restaurant, a favorite local eatery that he and his family LOVED ever since they were kids. As our little family grew, we’d visit every so often and chat with the owner Tim from time to time. Seeing as we’ve been SO busy the kids’ activities, we hadn’t been around to find out Carolina’s has recently expanded and opened an additional location in Anaheim! 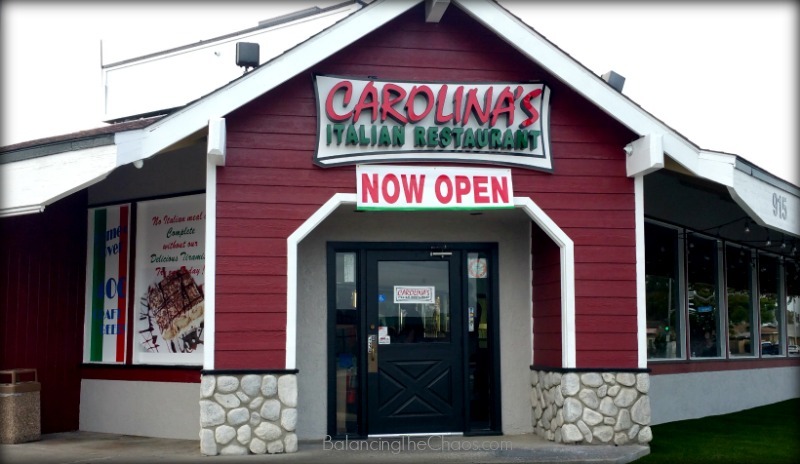 Restaurant Review sharing our honest opinions on behalf of Carolina’s Italian Restaurant. The new location in Anaheim at 915 S. Harbor Blvd is right down the street from Disneyland. When you walk in the doors, you’re quickly greeted by a friendly staff. 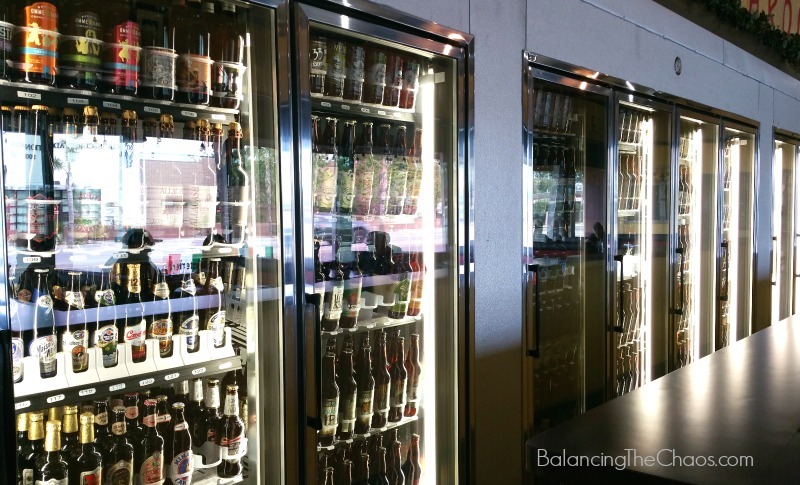 The first thing I noticed was showcase of over 400 beers, many from local brewery’s and rotated monthly. Tim, the owner, was definitely surprised to see us. It had been quite a while since we had a chance to visit, so it was really fun catching up with him. I loved his enthusiasm as he told me he had something special to show me. As we walked out side, with a sparkle in his eye, he proudly presented “the garden”. 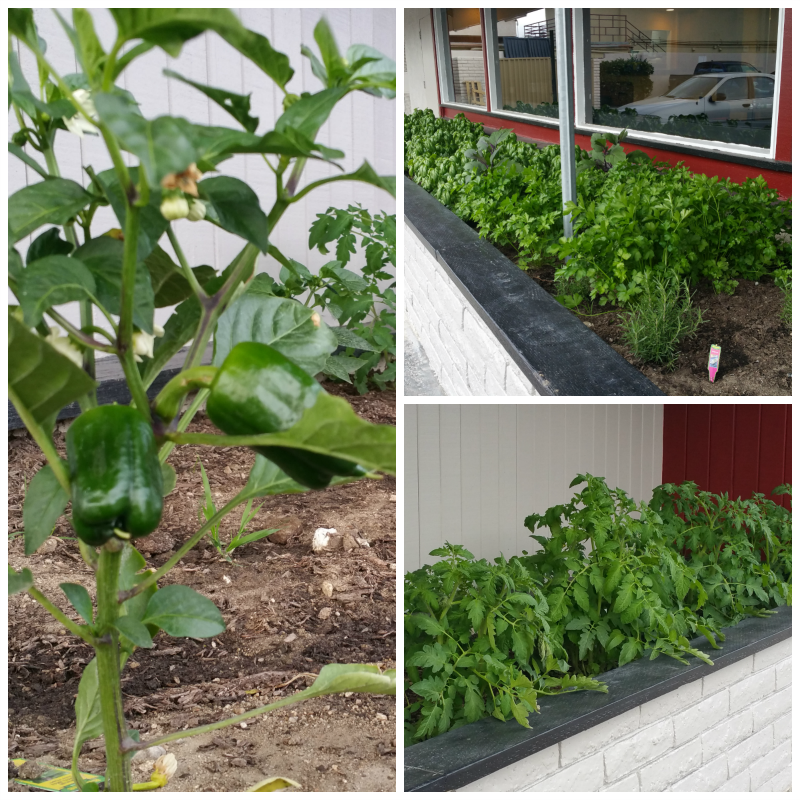 Carolina’s Italian Restaurant is currently growing their own herbs and vegetables to use in their delicious recipes. I love this trend with local restaurants – sustainable gardens with the freshest ingredients possible. Tim shared that the chefs enjoy walking out to the garden each morning and trimming the ingredients utilized in menu items like the Penne Pesto. We made our way back inside while I asked him about the signature dishes. The most popular include the Penne Pesto, the Eggplant Parmigiana, Chicken Alfredo and the Penne Franchascana – dishes we were going to need to try! Starting off we sampled their special Ceviche Appetizer. 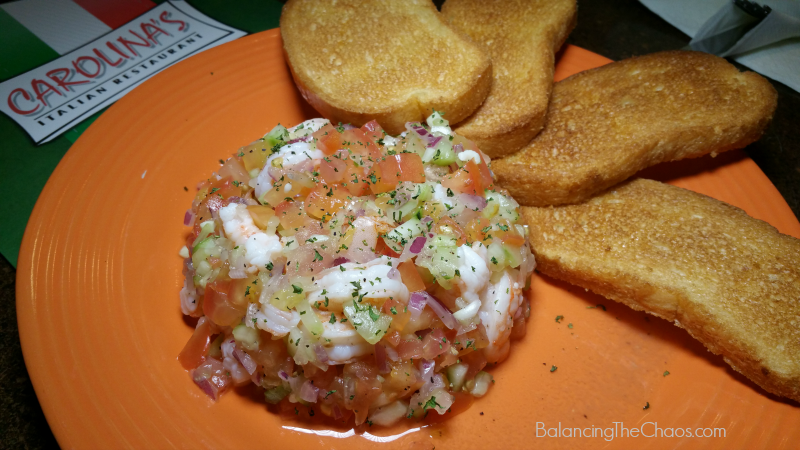 Delicious shrimp mixed with fresh tomatoes, red onion, herbs, cucumbers and more, this dish was difficult to share because I wanted it all! Once finished with the toasted bread, I just grabed a spoon to gobble up every last bite. 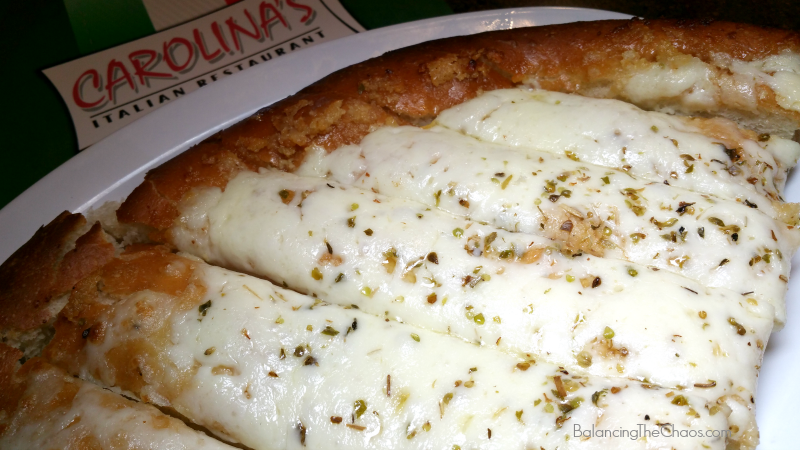 Served with every meal, Carolina’s Cheesy Bread is delicious. They take pizza dough and roll it out and add a hefty portion of mozzarella cheese with a mix of herbs. Then they bake it in their pizza oven and bring it out fresh to the table. 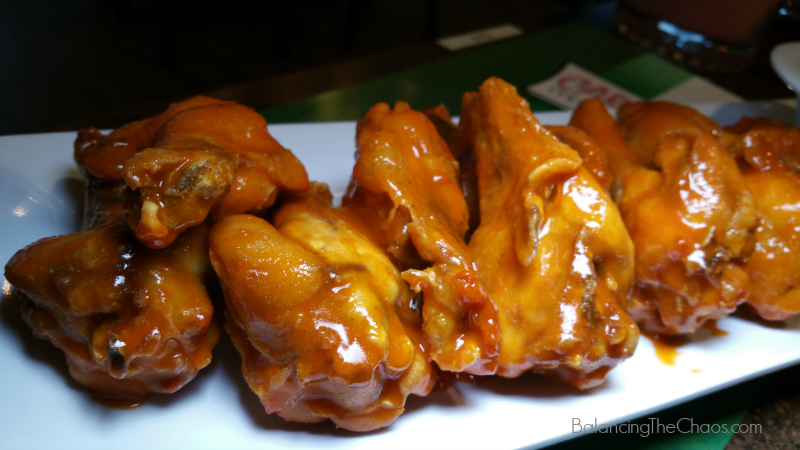 The hubster LOVES some delicious Buffalo Wings and he described these babies as super juicy and flavorful. They are available in the Carolina’s Sample Platter or order them by themselves. For dinner, we decided to go “Family Style” and get a little bit of everything. The one thing we didn’t account for was that the portions were HUGE! These amazing family style dinners are ideal for families of 4-6. 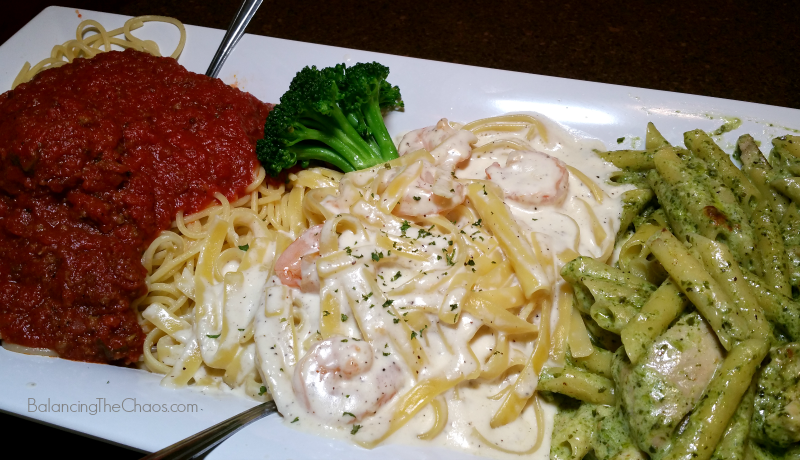 The Taste of Italy includes generous portions of Spaghetti with Meat Sauce, Fettuccini Alfredo (we added shrimp), and the Chicken Penne Pesto. 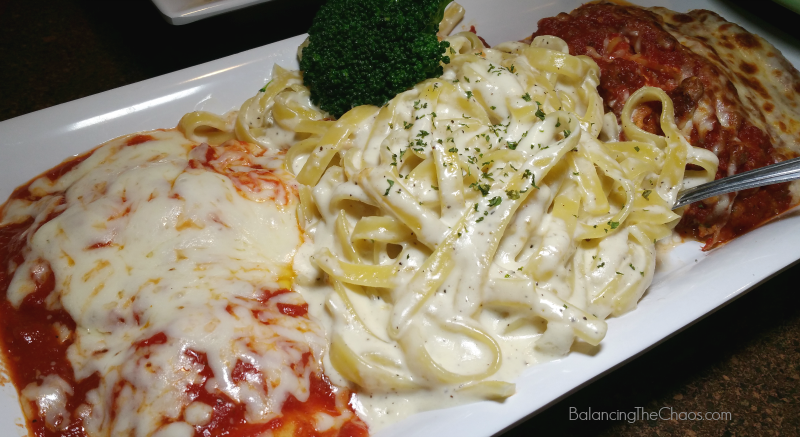 The Carolina’s Trio also offers generous portions of Beef Lasagna, Fettuccini Alfredo and Eggplant Parmigiana. 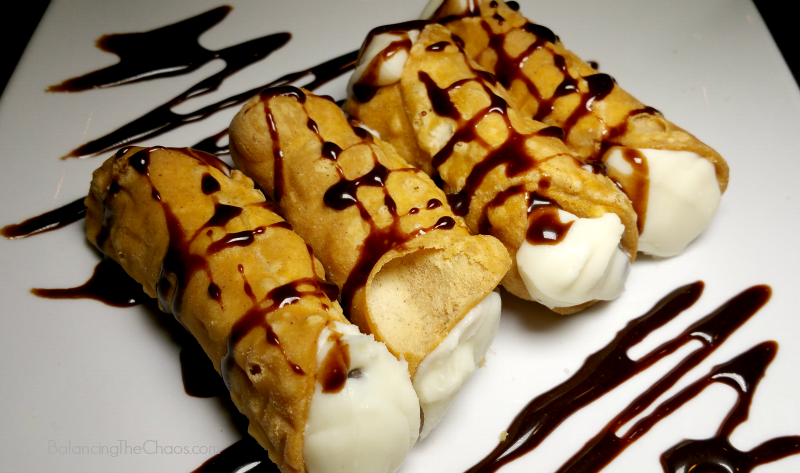 The Cannoli was absolutely mouth watering. It is delicious as it looks. 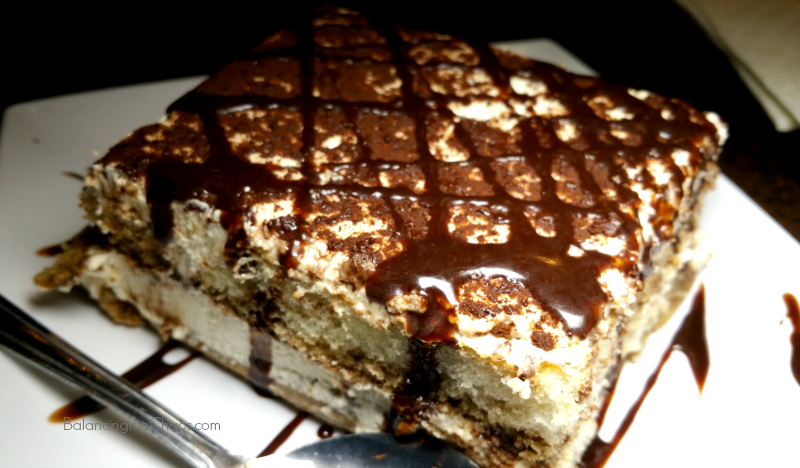 And the Tiramisu was just as fantastic. If you’re in the North Orange County area, I highly recommend hitting up Carolina’s for some delicious Italian cuisine. You’ll probably have enough left over lunch the following day too! Having a party or a meeting? Check out Carolina’s Catering Menu. Carolina’s is a generous supporter of my husband’s softball team – Savanna High School Girls Softball – as well as the school itself. They are always ordering pizzas and pasta lunches for delivery! Food sounds great. Our family loves Italian food. Glad its close by.